680 pages | 192 Color Illus. | 192 B/W Illus. An integrated analysis exploring current and relevant concepts, Fundamentals of Ecotoxicology: The Science of Pollution, Fourth Edition extends the dialogue further from the previous editions and beyond conventional ecosystems. It explores landscape, regional, and biospheric topics, communicating core concepts with subjects ranging from molecular to global issues. It addresses the increasing growth and complexity of ecotoxicological problems, contains additional vignettes, and employs input from a variety of experts in the field. Divided into 14 chapters, the book begins with an overall history of the field. It details the essential features of the key contaminants of concern today, including their sources. It examines bioaccumulation, the effects of contaminants at increasing levels of ecological organization, and the regulatory aspects of the field addressing the technical issues of risk assessment. The author includes appendices illustrating important environmental laws and regulations, and compiles key terms not already identified by section headings in the glossary. He also provides suggested readings at the end of each chapter and presents study questions at the end of the book. Fundamentals of Ecotoxicology: The Science of Pollution, Fourth Edition contains a broad overview of ecotoxicology, and provides a basic understanding of the field. 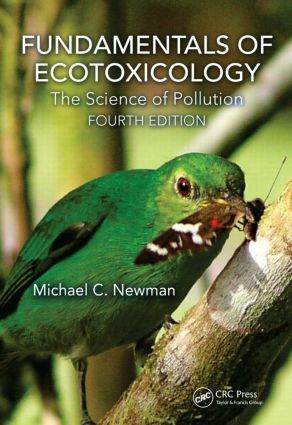 Designed as a textbook for use in introductory graduate or upper-level undergraduate courses in ecotoxicology, applied ecology, environmental pollution, and environmental science, it can also be used as a general reference for practicing environmental toxicologists. "This is the ideal. Comprehensive and up to date book on how chemical affect organisms and ecosystems. By including 30 vignettes the author has succeeded in bringing independent state of the science perspectives from a variety of experts. …It is a ‘must have‘ text on the shelves of students and practitioners of ecotoxicology." "This is one of the most, if not the most, comprehensive introduction to ecotoxicology available. It is a textbook about ecotoxicology in North America, but it makes a serious attempt to place the content matter in a global context by including guest authors, environmental regulations and case studies ("vignettes") from other continents and countries, such as South America, Europe, Australia, China and India. This is a major strength, especially since local pollution events have global implications. It is paramount that students of environmental science learn to appreciate the global dimension of those implications." "The text is well written, informative and complete. There is very good treatment of current issues and has an authentic feel of being relevant and timely compared to many textbooks. The text is also full of high quality and novel figures, images, and diagrams that greatly complement lecture material. I always enjoy the quotes too!" Michael C. Newman is a current professor of marine science at the College of William & Mary, Virginia Institute of Marine Science. His research interests include quantitative ecotoxicology, environmental statistics, risk assessment, population effects of contaminants, metal chemistry and effects, and bioaccumulation and biomagnification modeling. In addition to roughly 145 articles, he authored six books and edited another six on these topics. In 2004, the Society of Environmental Toxicology and Chemistry awarded him its Founder’s Award, "the highest SETAC award, given to a person with an outstanding career who has made a clearly identifiable contribution in the environmental sciences."